New Jersey has yet another hometown band to take pride in with Young Rising Sons, the dastardly foursome from Red Bank with a knack for crafting pristine indie pop and alt-rock anthems. At a glance, the band sounds a lot like 2010-era Neon Trees, with dynamic choruses fueled by explosive, chugging guitars that support vocalist Andy Tongren’s clear, infectiously catchy and creative hooks. 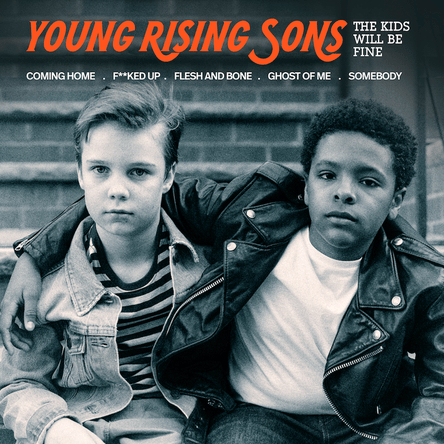 Since signing with Dirty Canvas/Interscope Records in 2014, Young Rising Sons have released two EPs. The Young Rising Sons EP sent the music world into a tizzy last summer with the upwards-spiraling chorus and whistling hook of lead single “High.” With an alluringly energetic stage presence and a set filled with high-octane melodies, Young Rising Sons have stayed true to their name as a band on the rise. 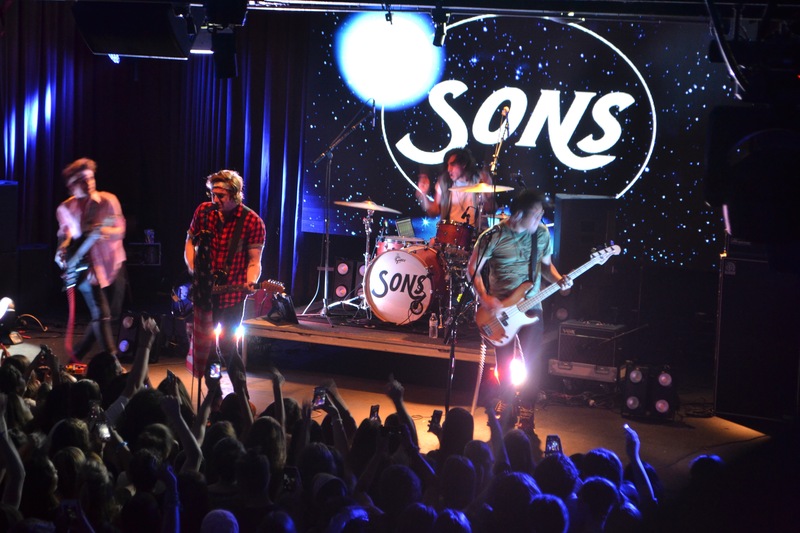 The past two years have seen nearly non-stop touring for Young Rising Sons; the band has had performance slots with everyone from The 1975 to KONGOS, The Griswolds, Bleachers, Miniature Tigers, and more. They recently finished up an extensive, two-month long summer co-headline tour with LA band Hunter Hunted that found them hitting cities large and small throughout the country. All this, with a total of about 6 original, released songs. Needless to say, Tongren and co. had the entire venue jumping up and down, screaming these lyrics at the top of their lungs. We can’t wait to see the finished music video! It’s no surprise that Young Rising Sons have toured successfully around the country without a full-length record: Though few in number, their songs are powerful and evocative, easily memorable, and – best of all – genre bouncing. They skirt the line between pop-rock and indie pop/alt-rock such that fans who would never associate with each other in most contexts will come together over Young Rising Sons. This is how a legacy begins. 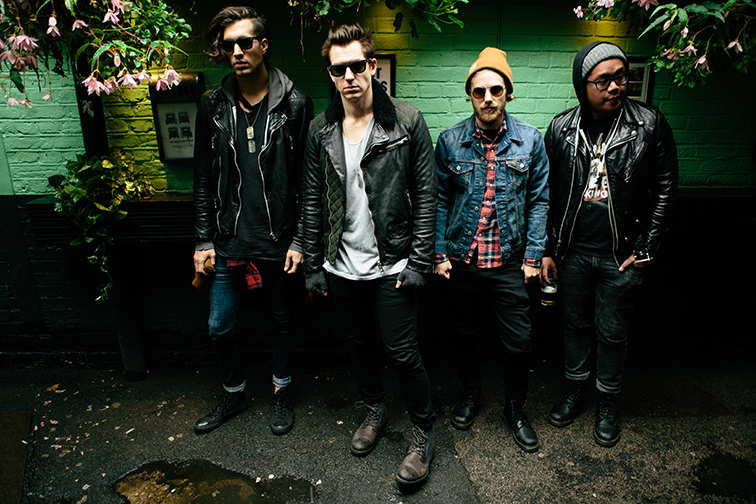 Our interest piqued, Atwood Magazine spoke with Young Rising Sons’ Andy Tongren about a week after the New York show, just as the band was getting ready for a well-earned break. Atwood Magazine: Great to meet you, Andy! Where am I finding you today? Andy Tongren: I am at home, in New Jersey, which feels awesome! We got a little breather [right now] – some downtime to collect ourselves before we get back into the studio and on the road again. Andy: Yeah, it’s been wild, but things are going well! We wouldn’t have it any other way. What was the first thing you wanted to do when you got off tour? Andy: Steve [Patrick, our drummer] and I wanted to go play ice hockey – we all play, but it’s usually Steve and I that go the most. I played twice yesterday, just to get in as much as I could. Other than that, I think everybody’s just vegging out and taking it easy – although it’s funny, after being gone for so long, it only takes two or three days at home before I start to go a little stir crazy and need to get out. It’s been a really, really long year or two for Young Rising Sons. Andy: Yeah, we were just talking about that – I don’t think we’ve been in the same location for longer than a week in the past year and a half! It’ll be nice to have a little bit of downtime, but really just – I don’t know – to get back into a regular lifestyle and be motivated to write again. That’s the biggest thing for me, at least, and I think for the other guys, too. We can kind of get back to our roots and how we write our best, and that’s actually exciting for us. We’re taking a week to go to a cabin in the middle of nowhere in Pennsylvania to hunker down and write there, and we’re excited about that. Andy: Before we signed with Interscope, thats how we did everything, and then [when we signed] they put us on the road immediately and that was great! But it’ll be nice to get back to our roots and where we came from. You guys went to a number of smaller US cities on this past tour. How were Niagara and Boise? Andy: They’re interesting. It’s cool to see both sides of the coin. In the smaller cities we played, the crowds weren’t necessarily as big, but they were just as enthused to have live music, which was really cool. I don’t know… Salt Lake City, in particular, was one of those places where it seemed like they don’t get live music that often, or so many artists overlook it. These people are so excited to have live music, and even if they don’t know your band, they’ll come out and enjoy themselves and have fun! It’s still cool to see that, and it’s definitely a different world than a New York or Los Angeles show, but the energy is still there, which is really cool! What was your favorite show on this tour? Andy: That’s a good question. The Michigan shows were awesome, and Boston was awesome… I think New York was the best in my mind, though, just because there was so much family and friends there for us. It kind of felt like a little homecoming. I lived in Chelsea for a little while, and I would go to shows at Highline Ballroom all the time. To be headlining there, it’s like, “Yeah, we did it!” We sold it out, and it was awesome – just a really cool experience. I was in that Highline Ballroom audience, and I thought the venue created a pretty intimate experience. Andy: Yeah, it’s a cool, intimate venue and it feels like a punk rock show almost. Also, we filmed a video that night for one of our songs, “F**ked Up,” which was awesome. I think it amped up the crowd a bit. That’s right, you mentioned doing that at the beginning of the night! Andy: I think that song certainly reacts live pretty well either way, but the energy that night was something else. Taking a step back for a second, do you feel as though you’ve changed significantly as a band since signing to Interscope? Andy: I don’t necessarily think we’ve changed. I think it’s more about coming into our own and realizing who we are as artists and as a band, and kind of figuring out exactly what we want to be. I think it definitely takes a little bit of soul searching, especially when you’re out on the road for so long, and starting to see things build and laying the ground floor to be ready to build the next level of the house. I think we’ve started to do that, especially with this new music we’re writing and the music we’re going to be putting out this fall. I think it takes a step in a really cool, new, different direction for us – but at the same time we’ll remain Young Rising Sons. So we’re really excited for us, and I think our fans are going to be really excited for us and everything. It’s been cool to grow together, the four of us, in the past year since we’ve signed… But it’s more growth than change, I think. I don’t think we’ve been in the same location for longer than a week in the past year and a half. Young Rising Sons’ formation is pretty interesting: To my understanding, you were approached by the other guys to sing in the band. Is that right? Andy: Yeah, they’ve known each other for what seems like forever now. I was going to school in New York and played a random open mic night thing. They happened to be there and were looking for a singer, and they approached me afterwards… It was instant chemistry. That first night I came down to practice with them, I think we didn’t even play that much. We just kind of hung out, talked, and Dylan [Scott, lead guitar] gave me a haircut (he used to double as the band’s barber). We sort of instantly became best friends, and then we played music together, and it was like, “Okay, we’re a band!” I don’t know, it worked out seamlessly. It definitely seems that way. You've got such great chemistry onstage together. Andy: It doesn’t matter how many people are there – we’re going to give our best show every night. Who tends to be the primary songwriter in the band? Andy: We all write together. Usually one of us will come in with an idea, and we’ll bounce it back and forth off each other and see what sticks. The cool thing about that is, when you’re all writing and you respect each other’s opinions as much as we do, it’s more of a democracy. We’ll use the best part and nobody gets hurt about it, because our endgame is the same: We want to write the best song that we can. I think that’s when the best songs come out. Let’s talk about 'Fucked Up'. What an anthemic song! Andy: Thank you, yeah – we’re really excited about it. Actually, we wrote that initially… I want to say three years ago? And it’s gone through several facelifts since then, but yeah, we started playing it last year when we were out on tour with The 1975. We noticed that people were really going crazy for it, and I don’t know if it’s because it has a curse word in it or what, but people seemed to be connecting with it. I don’t know – our thing is that we try not to write corny love songs, but I think it’s a modern day, truly told love story about how things don’t always go right – there’s always flaws in relationships. We wanted to capture that, and tell a true love saga rather than sugarcoat it with sunshine and rainbows. Just tell it like it is. What inspired it? It’s such a story. Andy: We – I mean, I’ve been in particular situations with girlfriends at the time where they’ve gotten ‘sloppy’ drunk, for lack of a better word, and you have to kind of babysit them, and hold their hand, and they’re maybe not the nicest at the time – you’re still going to be there for them… ‘Cause they’re them, so… Yeah, I think all of us have been there, in some sense – maybe not in that exact scenario, to a ‘tee’, but I think we’ve all experienced something comparable. I didn’t think it was about a girlfriend, to be honest. I thought it was about a one-night stand. Andy: Yeah, it could go either way. At least, in my mind when I picture it, I see a certain girlfriend. When we started it, I guess it went like a one-night stand going back and forth into this messy relationship. It's a great song, and it certainly got everyone riled up at the show. Speaking of which, you had an American flag bolted, front and center, onto your mic stand. Why the flag? Andy: It kind of sums up what we want to be as a band – you know, we’re from New Jersey, which is a pretty blue-collar state, Bruce Springsteen territory, which sums up that culture of the hard-working American class who has to work for everything they get. We’ve been a band for so long and had to work at it for so long, that we feel we had to work for it. It’s kind of a mark on where we came from and how proud we are to be from where we’re from. I think it kind of wraps up our band and our mindset, and what we want to do and what we want to be, into a little nutshell. We’re just proud to be where we’re from, that’s really what it is. Earlier you mentioned the new music that you're currently working on. 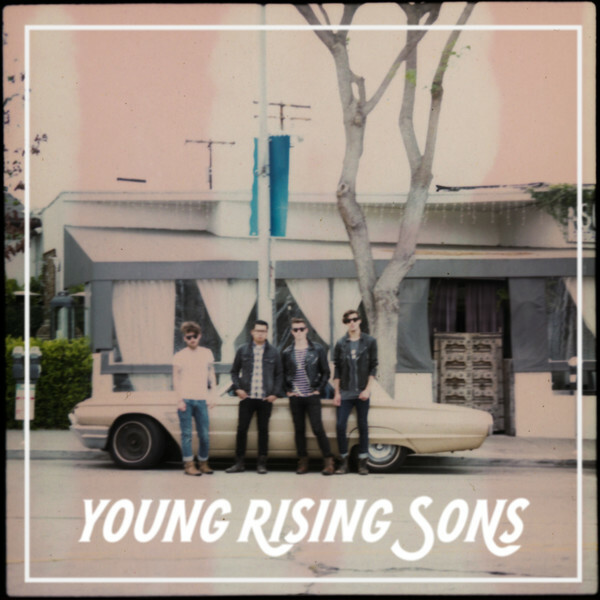 Young Rising Sons' music (to date) is so anthemic, with big, dynamic choruses and explosive, driving guitars. What can we expect from your new content? Andy: A lot of the same stuff that you just hinted on, actually, but I think more guitars, more of an alternative side, and more rock n roll. A little dirtier, a little messier – not quite as polished – that’s kind of what we’re going for. These songs that are going to be on it… [pauses] Being out on the road and seeing the way people react to certain things has made us even that much more excited to put these songs out. I think that fans are really going to be able to connect with them. Similar to “F**ked Up,” we tried to write things that aren’t sugarcoated – things that are about real life, real struggles that people face every day. I’d like to think that people will connect with that. 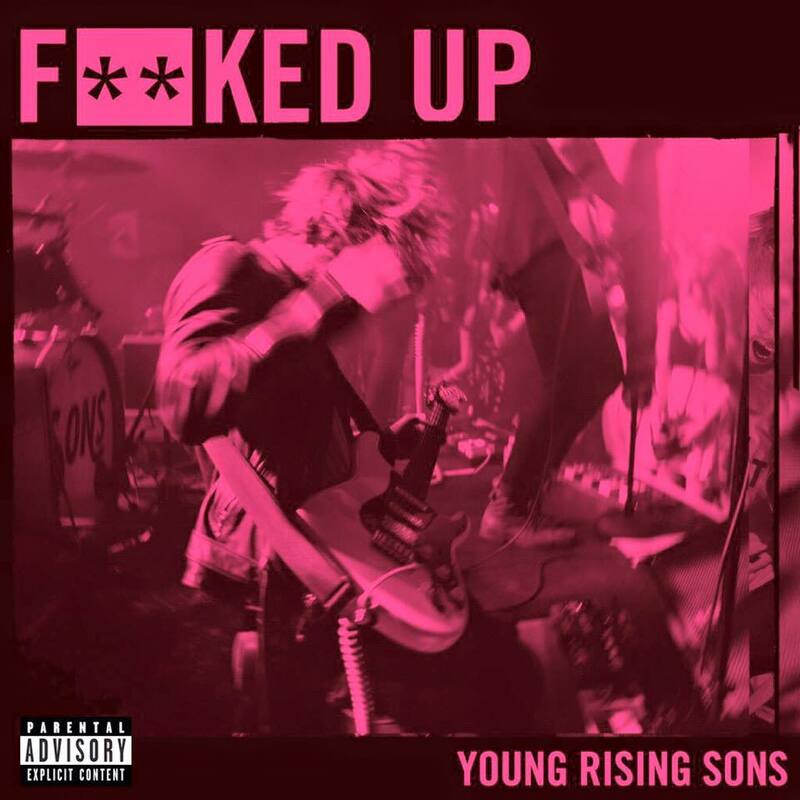 “Fucked Up” is a modern day, truly told love story about how things don’t always go right – there’s always flaws in relationships. We wanted to capture that, and tell a true love saga rather than sugarcoat it with sunshine and rainbows. What was the hardest thing for you, as a band, over the past couple of months? Andy: I think that the most difficult thing was separating and balancing touring versus recording. We put everything we have into our live show, so when we’re out on the road doing that every night, it’s exhausting in a great, beautiful way – but the last thing we want to do when we get offstage after playing a show like that is writing a song… Although, we are inspired on the road, so we want to make music, but we want to be invested in making the best show we can. At the same time, there’s that looming ‘we need to finish an album’ thought over our heads. It’s been tough to have that balance, which is why I think we’re excited to have these next couple of weeks off. I think that’s been the biggest struggle – figuring out what we’re going to be writing and the direction we’re going to be going in. But like I said, this new music we’re putting out, we’ve found it and we’re coming into our own. 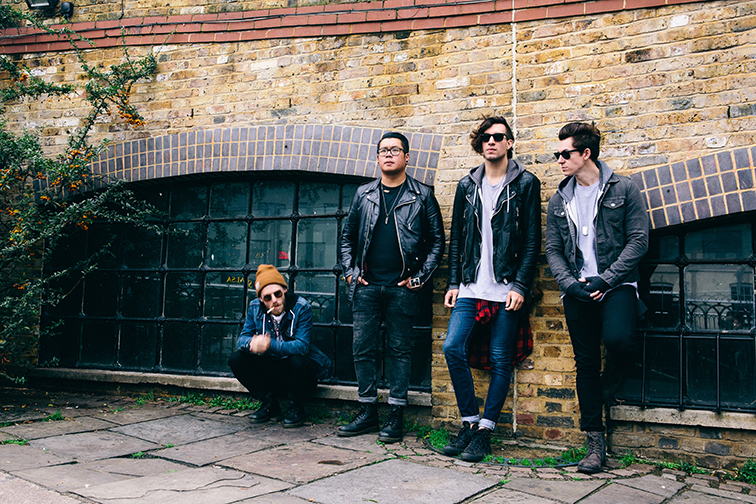 You can follow Young Rising Sons on Facebook, Instagram, Twitter, and Tumblr.